Before C.J.R. 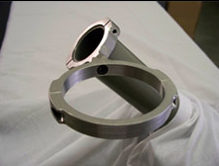 Products could design and build the G-Force II Reservoir we had to build a reservoir dynamometer to use for testing. We reviewed all of the reservoirs on the market from A-Z and tested these reservoirs to check for aeration and cavitation, which is air entering the system through the reservoir when the fluid washes up the side of the reservoir. When this happens an air pocket is created in the bottom of the reservoir, resulting in air being pumped into the power steering system thus causing power steering failure in the corners. Additionally, the metal parts in the pump cannot lubricate which results in the build up of heat, and air rather than adequate fluid. 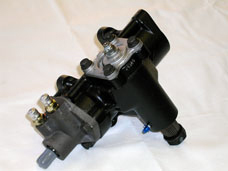 As racing experts, we all know the power steering system works off of fluid, not air. C.J.R. tested everything that your race car will do on the race track; braking when you have to dive into the corners, G-Forces in the corner, cleaning your tires off and brake-checking under caution flags. If you want to simulate this yourself, simply take a one-quart jar and fill it ¾ full with water and shake it. You will see an air pocket at the bottom of the jar during the up and down motion. This is what your racecar will do during race conditions and under caution as mentioned before. 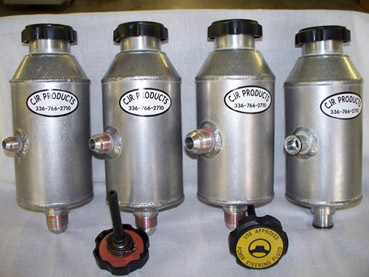 However, it is important to remember that you have to have the proper lines on the car, free of obstructions, the lines must also have the proper vacuum rating to avoid sucking shut, no loops in the line, the feed line should remain lower than the bottom of the reservoir and higher than the pump at all times. The C.J.R. 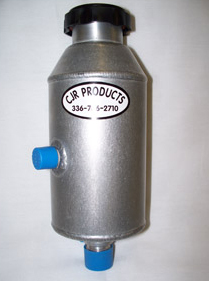 designed G-Force II reservoir utilizes a cap that is vented with a press pop-off valve inside which is designed to release air and it has a dipstick to monitor the level of the fluid. C.J.R. has tested this reservoir in Sprint Cup, Nationwide, Camping World Trucks and Saturday night racers and they are all very happy with the results they have found. C.J.R. has had customers to call back after installing the G-Force II on their race car and say that “the G-Force II fixed the problems I have had for years”. The G-Force II is by far the best reservoir on the market and comes with a money back guarantee if you are not satisfied. 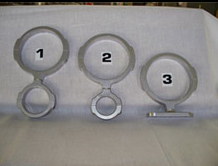 All G-Force II brackets are made to swivel for any application. All brackets have a ball joint type taper to lock in place, by simply tightening the 1/4″ socket head screw you can achieve any desired angle.